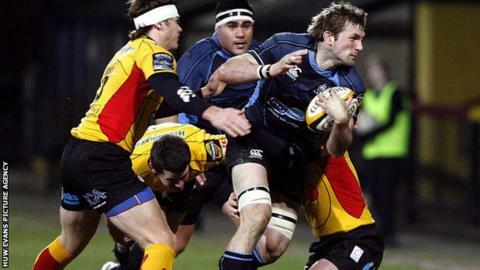 The Scarlets have signed Scotland flanker John Barclay on a three-year deal from the start of the 2013-14 season. Barclay, 26, joined Warriors at 17 in 2004 and has won 41 Scotland caps during his nine-year spell in Glasgow. He has made 150 appearances for Glasgow and played in their five-try 35- 17 victory over the Ospreys last Friday. "I am now really looking forward to moving to the Scarlets next season," said Barclay. "Having seen the ambition they play with, the style, rugby philosophy and tradition of such a great rugby region, I know that it will be a great move for me. "I've been lucky to be with Glasgow for nine years and helped take Glasgow to develop into what is now seen as a very competitive side. "Having been with them all my professional career, to move somewhere new, it had to be to the right club with an environment and philosophy I could relate to and to a team that I could make a difference within. "It's going to be an exciting opportunity for me to experience a new environment in west Wales in the first move of my club career." He will enter a back-row mix that includes Welsh internationals Aaron Shingler, Josh Turnbull and Rob McCusker. Barclay's signing follows the loss of the Scarlets Wales wing George North to Northampton Saints and fly-half Owen Williams to Leicester Tigers ahead of next season. "John is a dynamic player who will offer another added dimension to the existing talent we have in our back row," said Simon Easterby, the Scarlets head coach. "He has shown that he is really at the top of his game since coming back from injury. "At just 26, he brings world-class experience yet still has his best rugby years ahead of him."